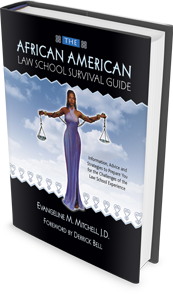 This empowering and comprehensive book is a must read guide for any person thinking about applying to or who is getting ready to attend law school – one of the most challenging postgraduate, professional school programs – and who wants to maximize their experience! There are many books out there that discuss important things you need to know regarding the law school experience, but this is the first and only one that gives you all of that key information plus pays special attention to the unique issues and concerns particularly facing African American law students! - Physical, Mental and Spiritual Health and Well-Being And much more!!! This essential and reader-friendly primer is filled with numbered, digestible and easy-to-read facts, advice, observations, and anecdotes based on the author’s research, as well as personal experiences in four different law school environments. Furthermore, it features thoughtful, enlightening and invaluable contributions from law students, lawyers, law professors and law school administrators across the nation who genuinely want to see future Black law students succeed! Yes, law school is a means to an end, but you don’t want to merely survive in law school, you want to thrive – and you can do this best by better understanding what you are about to face and applying the information inside. This resource helps you put the experience into perspective. This book should be required reading for all prospective law students serious about being prepared for and truly making the best of and the most of their entire law school experience. Copyright © 2002-2014 Evangeline M. Mitchell, Hope's Promise Publishing. All Rights Reserved.